Funding for private family law cases is generally only available where the applicant for legal aid can show that they are a victim of domestic abuse, or where they can show that the aim of the proceedings is to protect a child at risk of abuse from a third party (such applications are in scope because of Paras 12 and 13 of Part 1 Schedule 1 of LASPO; see also Chapter 6 of the Handbook). Until the successful challenge to the original regulations by Rights of Women, there was a requirement that the evidence in support of the application had to be no more than 2 years old. Following the litigation, that was extended to 5 years. Evidence that B has been arrested for a relevant domestic violence offence. A relevant police caution for a domestic violence offence. Evidence of relevant criminal proceedings for a domestic violence offence which have not concluded. A relevant conviction for a domestic violence offence. Evidence of a court order binding over B in connection with a domestic violence offence. A domestic violence protection notice issued under section 24 of the Crime and Security Act 2010 against B. An undertaking given in England and Wales under section 46 or 63E of the Family Law Act 1996 (or given in Scotland or Northern Ireland in place of a protective injunction) by B provided that a cross-undertaking relating to domestic violence was not given by A. A copy of a finding of fact, made in proceedings in the United Kingdom, that there has been domestic violence by B. An expert report produced as evidence in proceedings in the United Kingdom for the benefit of a court or tribunal confirming that a person with whom B is or was in a family relationship, was assessed as being, or at risk of being, a victim of domestic violence by B. (b)in the reasonable professional judgement of the author or the examining appropriate health professional A has, or has had, injuries or a condition consistent with being a victim of domestic violence. confirming that there was a referral by an appropriate health professional of A to a person who provides specialist support or assistance for victims of, or those at risk of, domestic violence. A letter from any person who is a member of a multi-agency risk assessment conference (or other suitable local safeguarding forum) confirming that A, or a person with whom A is in a family relationship, is or has been at risk of harm from domestic violence by B. A letter from an independent domestic violence advisor confirming that they are providing support to A. A letter from an independent sexual violence advisor confirming that they are providing support to A relating to sexual violence by B. (c) a description of the support they provided to the victim of domestic violence or the person at risk of domestic violence by B. A letter from an organisation providing domestic violence support services. (c) provided A with support in relation to A’s needs as a victim, or person at risk, of domestic violence. (d) a statement of the reasons why A needed that support. (c) they sought admission to the refuge because of allegations of domestic violence by B. A letter from a public authority confirming that a person with whom B is or was in a family relationship, was assessed as being, or at risk of being, a victim of domestic violence by B (or a copy of that assessment). A letter from the Secretary of State for the Home Department confirming that A has been granted leave to remain in the United Kingdom under paragraph 289B of the Immigration Rules. Evidence which the Director is satisfied demonstrates that A has been, or is at risk of being, the victim of domestic violence by B in the form of abuse which relates to financial matters. Evidence that B has been arrested for a child abuse offence. A relevant police caution for a child abuse offence. Evidence of relevant criminal proceedings for a child abuse offence which have not concluded. A relevant conviction for a child abuse offence. A copy of a finding of fact made in proceedings in the United Kingdom of abuse of a child by B. A letter from a social services department in England and Wales (or its equivalent in Scotland or Northern Ireland) confirming that the child was assessed as being, or at risk of being, a victim of child abuse by B (or a copy of that assessment). A letter from a social services department in England and Wales (or its equivalent in Scotland or Northern Ireland) confirming that a child protection plan was put in place to protect the child from abuse or a risk of abuse by B (or a copy of that plan). An application for an injunction described in paragraph 5 of this Schedule made with an application for a prohibited steps order against B under section 8 of the Children Act 1989 which has not, at the date of the application for civil legal services, been decided by the court. unless there is some other form of evidence which would also justify a grant of legal aid. The new evidence requirements are not backdated. They will only apply to Controlled work applications signed from Monday 8 January onward. Licensed Work applications signed from Monday 8 January will be made under the new rules, but those signed before that date and received by the LAA before 5pm on 15 January will be treated under the old rules. Grants of emergency representation made before 8 January will be treated under the old rules even if the 5 day notification is received by the LAA after 8 January. This is a helpful development. Although the requirement to obtain evidence is still in place – with all the practical difficulties that causes – the widening of the range and age of what constitutes acceptable evidence should help make legal aid available more widely than before. The manner of the change is also a helpful development. We have been saying for some years now – in the Handbook, on this site and elsewhere – that the current system of amending the scheme is not fit for purpose. Post-LASPO, most of the significant rules are no longer in LAA documents, but in primary and secondary legislation. Amendments to the rules are made via amendments to the legislation. Neither the MoJ nor the LAA make consolidated versions of the regulations available, and nor does the legislation.gov.uk website. That means – unless you have the sort of subscription legal research tool that is unaffordable to most legal aid lawyers – the only way to work out the current rules is to cross-reference the original and amending regulations. The civil legal aid merits tests, for example, are not publicly available – unless you read four sets of regulations side by side, manually amending them as you go (or unless you buy the Handbook!). The MoJ and LAA should urgently make available – and keep up to date – a single consolidated version of all the key legal aid regulations. It cannot be right that the fundamental basis of the scheme is obscure to practitioners – and impenetrable to the public using it. It hasn’t yet gone that far, but removing the previous much amended sections of the Procedure Regulations and replacing them with a single up to date Schedule is a welcome step in the right direction. In the meantime, links to all the regulations and other resources can be found on our Resources page. The new edition of the Handbook has now been published and pre-order copies are being dispatched. You can order your copy from LAG here. 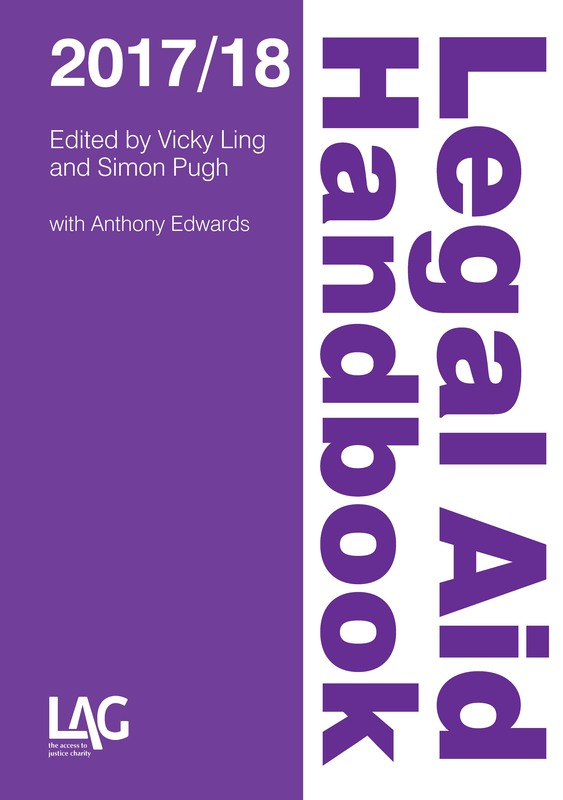 This book is an invaluable companion and essential reading for all legal aid practitioners, from caseworkers to senior partners. The authors have expertly pulled together information that is not currently available in one place providing the only single volume guide to the criminal and civil legal aid scheme. ‘… admirably clear on some very tricky points. There should be at least one copy in every office where legal aid work is carried out.’ Carol Storer, director, LAPG. ‘I wish I could say “this book is never off my desk” but the truth is my copy of LAG Legal Aid Handbook always appears to be on someone else’s … Essential reading for all practitioners seeking to provide a first class service to clients in a post-LASPO world.’ Phil Walsh Partner/Practice Manager, Miles & Partners LLP. The LAG legal aid handbook 2017/18 gives practical, step by step guidance on conducting cases, getting paid, advocacy, financial and contract management, performance monitoring and quality standards and an overview of recent policy developments. There are separate chapters on all the major areas of law covered by legal aid and sections devoted to litigators and advisers, advocates and managers. The only comprehensive guide to the whole legal aid scheme, the new edition features chapters written by expert contributors Anthony Edwards, Richard Charlton, Steve Hynes, Solange Valdez-Symonds and Katie Brown. The LAG legal aid handbook 2017/18 is packed full of case studies, checklists and practical tips. It provides clear and easy to follow guidance on the ever more complex legal aid system and is essential reading for everyone involved in legal aid from new caseworkers to experienced lawyers and managers. The new Handbook – coming very soon! The Handbook is edited by Vicky Ling and Simon Pugh, and features contributions from a range of subject experts including Anthony Edwards, Steve Hynes, Richard Charlton, Solange Valdez-Symonds and Katie Brown. You can pre-order your copy now by e-mailing: direct.orders@marston.co.uk or phoning: 01235 465577, or by clicking here. Upcoming training – with free books! Our publisher LAG is running training courses by two of the Handbook’s editors as part of its autumn training programme. Vicky Ling is delivering “Managing Civil Legal Aid Contracts” in London on 15 September. Participants get a free copy of the Handbook. More details here. Anthony Edwards is embarking on a national tour speaking on criminal costs. Participants get a free copy of our sister publication, Anthony’s book (with Colin Beaumont) Criminal Costs. More details, including dates and venues, here.